Backcountry Access, often shortened to BCA, is dedicated to creating the highest quality safety gear to enhance your backcountry experience. The self-declared most trusted name in backcountry safety aims to avoid gear-failure when time is of the essence. The company adheres to experience-driven design cues that are proven to work in unforgiving conditions. The BCA Slope Meter is a necessary tool for just about any backcountry enthusiast. The simple device is great for validating your choice of ski-line, ensuring proper bragging rights, and helping to gauge your comfort-level in questionable terrain. At the .. Crystal Cards are crucial for analyzing snowpack-structure as the difference between a weak layer and a well-bonded layer doesn’t look a whole lot different to the naked eye. Crystals placed on the cards, however, become instantly recognizable and sizable..
A comprehensive set of snow-study tools in a handy kit. 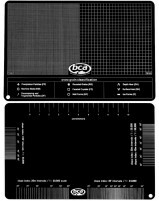 The BCA study kit is designed to be beginner-friendly due to its simple and self-contained natured, but it’s also used by expert forecasters for the same reasons. The durable fabric-case includes sev.. While exploring nature’s mighty splendors, it’s easy to venture out of shouting distance or lose sight of your partners. Backcountry Access solves the problem with the BC Link 2.0 radio. Compatible with any pack with shoulder straps, the BC Link 2.0 has a..